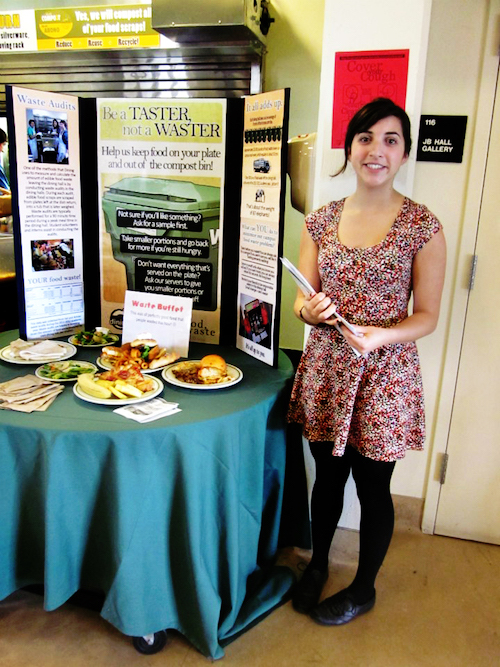 Victoria Salas helped educate fellow students about food waste. She graduated in 2014 with a B.A. in environmental studies and economics. The U.S. Environmental Protection Agency has recognized the waste reduction accomplishments of UC Santa Cruz Dining Services, a participant in the EPA’s Food Recovery Challenge. The initiative applies sustainable materials management practices to decrease wasted food and municipal and industrial wastes in the United States, leading to economic and environmental improvements. The campus achieved impressive source reduction of wasted food through a variety of approaches involving both staff and students. Dining Services monitors and tracks wasted food in the kitchen, from buffets and serving lines and plate waste. Staff members use this information to adjust the amount and type of food they order and prepare. Dining Services also trains kitchen staff to properly store and rotate ingredients, and to use the best preparation techniques to reduce wasted food. Additionally, they pre-plate appropriate serving sizes, educate students on daily offerings and give samples so diners take only what they will eat, and educate student and staff about wasted food and waste reduction. “We have been told by students that what they have learned while dining with us carries over when they go home, and they have become ‘waste warriors’ for their families and communities,” Dining Services Sustainability Mananger Clint Jeffries said. UC Santa Cruz is one of 29 recipients of the 2014 Food Recovery Challenge Award given for achieving the highest percentage of food waste prevention. The EPA presented UC Santa Cruz with the top national award for source reduction – reducing wasted food on the front-end through careful training, menu-planning, and ordering. UC Santa Cruz achieved its goal of working towards zero waste in all campus food locations by engaging students on sustainable agriculture and food systems. The campus reduced 100 tons of food waste, donated 1,000 pounds of food, and diverted 650 tons of food from landfills by expanding composting efforts on campus, saving their university more than $19,000. In 2014, nearly 800 governments, businesses and organizations participated in EPA’s Food Recovery Challenge, including grocers, educational institutions, sports and entertainment venues and restaurants. These entities diverted wasted food from entering landfills or incinerators through a variety of innovative actions, including creative re-use of trimmings by university dining staff; donating excess, wholesome food to food banks, shelters and soup kitchens; composting in urban settings; and using wasted food to produce electricity.